posted 17 July 2017; revised 28 Aug 2017; addendum added 11 Oct 2017. N January 24-25, 2017, Christian apologist James White and Muslim scholar Yasir Qadhi held two public dialogues in the Memphis, TN, metropolitan area. The first night they met at Grace Bible Church in Olive Branch, MS. The following night they concluded their conversation in the mosque at the Memphis Islamic Center. The aim was to compare and contrast Christian doctrine with Islamic belief and in Dr. White's words (about 40 seconds into his introduction) "to discuss differences that we have." Both speakers explicitly disclaimed any ecumenical ambitions. White said he hoped the dialogues would encourage Christians to approach their Muslim neighbors with love and sincere concern rather than blind fear and sheer contempt. Indeed, the Muslim community is a vast mission field, mostly unreached with the gospel of Jesus Christ and long overdue for a great harvest. Dr. White has been engaged in Islamic evangelism for more than 15 years. (He learned Arabic so he could read the Koran in its Authorized Version.) He has frequently made the point that our Muslim neighbors are not all violent enemies to be feared or despised, but they are all precious souls to be won. That, he said, was the most important message he hoped Christians would take away from these dialogues. It was a cordial conversation, and although the second half of the dialogue took place in a mosque, Dr. White had an opportunity there to give a clear, complete presentation of the gospel. Dr. White has appealed to Paul's activities in Acts 13:14ff; 17:2-5, 17-18; 18:4,etc. as the biblical model for what he was seeking to accomplish. Brannon Howse lives in the Memphis metropolitan area, near where the event took place, but he didn't notice it until six months later. In June of 2017, he played sound bites from the dialogue and accused Dr. White of violating 2 John 7-11. Since then (at least through 14 July) he and various guests on Worldview Weekend's daily radio broadcast have relentlessly fulminated against Dr. White, impugned his motives, denied that he is born again, labeled him a "heretic," called for him to be turned over to Satan, and generally given the impression that if it were in their power to do so, they would be prepared to consign him to the eternal flames. Before I became aware of the issue, Mr. Howse had already spent an entire week on his Worldview Weekend Radio program stoking the controversy. He began salting his commentary with selected excerpts from John MacArthur's sermons about heretics and false teachers, insisting that John MacArthur would certainly be in agreement with Worldview Weekend's harsh condemnation of Dr. White. But Dr. White spoke at an event sponsored by one of John MacArthur's ministries during Shepherds Conference week 2017—and that was literally just a few weeks after the Memphis dialogues. So I began to get emails, Tweets, text messages, and Facebook comments from confused listeners asking our ministry's official position. 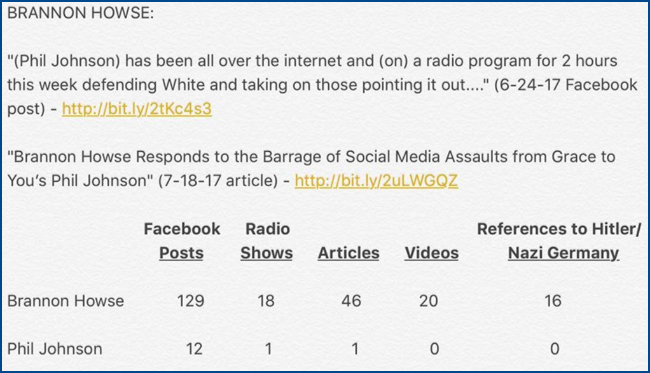 I posted a couple of Tweets tersely indicating that in our judgment Howse's critique of Dr. White was overblown and unfair—and that this kind of thing has been an unfortunate pattern with Howse. I was traveling for three and a half weeks after that, so I made little effort to respond to the questions and comments I've received from people asking for even more clarity. This post is an effort to catch up with the most important things that I've been asked or challenged with. I am also calling on Phil Johnson of Grace to You to publicly repent and apologize for being all over social media for weeks & on a podcast defending James White's interfaith dialogue with this reported Muslim Brotherhood aligned Jihadi preaching Imam. Phil is on the wrong side of Biblical truth, history, and national security on this issue by defending James White's interfaith dialogue with Yasir Qadhi. —Brannon Howse on Facebook. irst of all, I did not "[defend] James White's interfaith dialogue with Yasir Qadhi"; I condemned the intemperance of Dr. White's chief critic. Those are totally separate issues. I did expressly say (repeatedly) I don't like the idea of public dialogues with teachers of false religion. This may come as news to those who feed on over-hyped criticism full time, but it is possible to disagree with a brother in Christ without automatically branding him as a heretic and trashing his reputation. So without "defending James White's interfaith dialogue" I simply refused to give a nod of approval to those seem to think Dr. White must be banned from public ministry, hounded out of Christian leadership, excommunicated, shunned, or otherwise publicly disgraced. Those who are keen to accuse me of compromise or hypocrisy should at least have the candor to acknowledge what my actual point was. Second, Mr. Howse's suggestion that I've been trying to stoke a conflict with him on social media is laughable. 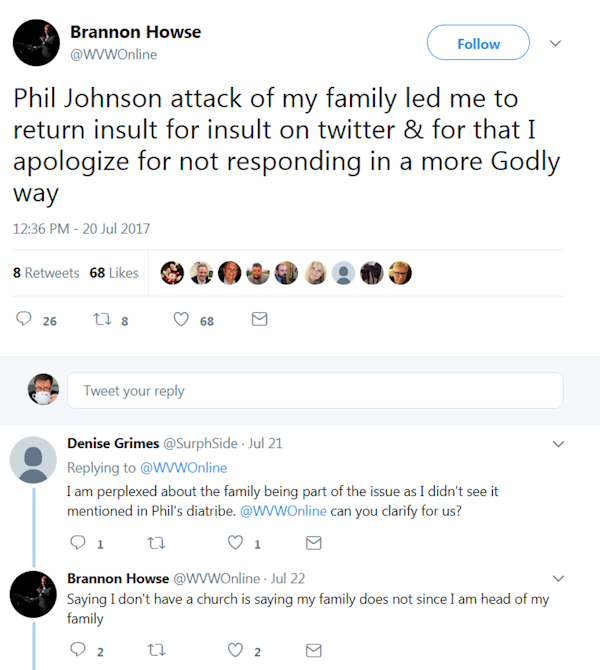 Is there any respectable Christian leader @WVWOnline HASN'T found fault with? Other than that, what little I have said about the issue (prior to this) in social media or in any other context has been a fairly brief document in response to some of the most common questions people were asking, and the odd comment here and there in reply to questions or remarks that somehow caught my eye. As my FaceBook pages reveal, I've been away from my home and office since June 21, and I have not been in a position to read everyone's comments or listen to the multitude of sound-bites—much less reply to Brannon's unrelenting remarks about me on his radio broadcasts, blogposts, and Twitter feed. My silence does not signify retreat or befuddlement. If you admit that you would never host a public dialogue with a Muslim leader at Grace Church, isn't it hypocritical to attack those who have criticized James White for doing that very thing? My complaint is that the criticism of Dr. White has been grossly overblown and over-hyped. Here is a man whose whole life has been devoted to the proclamation and defense of the gospel. Perhaps no one has spent more time on the front lines of public debate against heretics and gospel-twisters than Dr. White. He proclaimed the gospel without cutting corners or softening the hard parts in this very context—in an Islamic mosque! This is, after all, a disagreement about strategy, not a dispute over the content of the gospel. It's quite true that the ends don't justify the means, but that is a truth that cuts both ways. Slander and exaggeration cannot serve the cause of truth. And to portray Dr. White as a wolf in sheep's clothing is a grotesque slander. Furthermore—to reiterate something I alluded to above—Christians ought to be able to disagree with one another without casually throwing anathemas at one another. We're not obliged to see every person (especially fellow believers) as either thoroughly evil or perfectly sound. We don't write off the heroes of faith in Scripture who sinned (in some cases, notoriously). We shouldn't automatically write off faithful brethren today when they do things with which we disagree. That kind of thinking killed the fundamentalist movement. Good men sometimes do wrong, careless, unwise, or thoughtless things, and it's not always necessary to impute evil motives to them. Even the smartest of faithful men can have bad ideas. I've entertained wrong beliefs from time to time myself. A little self-awareness in this area ought to make us all more "swift to hear, slow to speak, slow to wrath." My friends will attest that I am not averse to all controversy. There certainly are gospel corrupters and false teachers in the visible church "whose mouths must be stopped, who subvert whole households, teaching things which they ought not, for the sake of dishonest gain" (Titus 1:11). Dr. White is an elder in his church, accountable to other elders, while the provocateur in this dumpster fire is a full-time controversialist and ecclesiastical pettifogger who, as far as I can determine, is not a member of any church and not accountable to anyone in church leadership. * I have never once heard Mr. Howse proclaim the gospel, expound a passage of Scripture, or teach anything that is spiritually edifying while avoiding controversy or captiousness. They deserve full-throated condemnation from sound and faithful teachers. But nonstop conflict is neither healthy for the controversialist nor edifying to his hearers. Besides, Dr. White is not one of those false-teaching miscreants who need to be silenced, and the entire body of his work gives testimony to that. One of the biggest ironies here is that Dr. White is an elder in his church, accountable to other elders, while the provocateur in this dumpster fire is a full-time controversialist and ecclesiastical pettifogger who, as far as I can determine, is not a member of any church and not accountable to anyone in church leadership. * I have never once heard Mr. Howse proclaim the gospel, expound a passage of Scripture, or teach anything that is spiritually edifying while avoiding controversy or captiousness. Perhaps he does do these things on rare occasions, but every time I have ever tuned in his broadcast or read his blog, he is nostril-deep in controversy and self-promoting hype. In short, he has a penchant for attacking men more faithful than himself and thereby poisoning his listeners with an unnecessarily critical spirit. That was the point of my criticism. It was not a defense of public Muslim-evangelical dialogues. 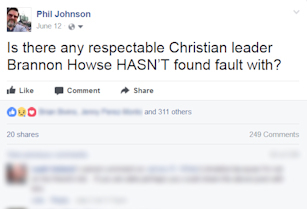 While this dispute with Brannon Howse was going on, you expressed disapproval of a ballet-style performance featuring three male dancers for the offertory in a church's communion service. How can you condemn that, and yet not care when a Muslim Imam is given a platform to teach in the church? Again, I have clearly expressed my disapproval of church-sponsored public forums where heretics are given a platform to teach without any challenge or debate. The suggestion that I "don't care" about that ignores what I have said. Those who criticize the White-Qadhi dialogues in an even-handed, non-slanderous way will get no argument from me. There are valid criticisms that can be made about this strategy of public dialogues where true and false religion share a platform and have an equal voice. I don't believe that's the ideal forum for gospel ministry. It goes against my presuppositionalist scruples to give equal time to error or false religion. But: 1) "In every way, whether in pretense or in truth, Christ is preached . . . in this I rejoice, yes, and will rejoice." 2) The gospel was declared in that mosque more clearly than it came through in that dance. And 3) James White clearly has no ecumenical agenda. The suggestion that he is either deliberately or unwittingly promoting Islamic teaching is ludicrous. One more reply to this question: If Dr. White had held a dialogue with an Imam in an actual worship service as a prelude to communion, he would have received the same disapprobation from me as those who decided Redeemer's ballet performance fit nicely into the order of worship. But Dr. White's conversation with the Imam was a different kind of event. Those who suggest I'm being inconsistent here are comparing apples to lug nuts. If Brannon Howse apologized to John MacArthur and received Pastor MacArthur's forgiveness for Howse's 2008 on-air attack against him, why did you bring that up? I'm not privy to John MacArthur's private correspondence. Howse may well have made some kind of private apology, and if so, I'm certain John would have graciously received it. But the attack was public, emphatic, and prolonged. I heard it. Tens of thousands of listeners heard it. I still have a recording of it. A meaningful apology would likewise have been public, not a note passed in secret. If Howse did ever make an explicit public apology, I've never heard it. There's a larger back story here, too. I talked to Mr. Howse by phone shortly after he had his supposed change of heart. He called to say he had removed the record of that broadcast where he and a guest pilloried John MacArthur, and he wanted me to remove a reference I made to the attack in an online forum. He assured me then that he intended to move away from nonstop polemics and heresy hunting. He said he wanted to do radio broadcasts with more biblical content and edifying subject matter—moving away from political and topical controversies. I was skeptical, wondering if he had really experienced a true change of heart or if this was just a superficial rebranding. I expressed that concern candidly and told him I would withhold judgment and abstain from public criticism until he had ample opportunity to establish his new direction. Brannon has flipflopped (and continues to do so) between fawning flattery and open disrespect in his dealings with Dr. MacArthur and our ministry. Given the way he has relentlessly tried to implicate John MacArthur in his assault on James White (while saying disparaging things about the elders of Grace Church and the staff of GTY), I don't think it was out of line for me to bring up the fact that Brannon's double-mindedness is a long-established pattern. Still, if there is now online a recording of an earlier public apology from Mr. Howse to John MacArthur and someone can point me to it, I'll apologize for bringing up the fact that Mr. Howse once attacked John MacArthur in a way that is similar to his current assault on James White. Why hasn't John MacArthur personally made a statement about this? Many would be interested in his take. He read and approved my response to the early questions, and he deemed that a sufficient reply. How do you reconcile your defense of public Muslim-evangelical dialogues with your own teaching on 2 John? Again, I haven't "defended" public interfaith dialogues. Though I'm not on board with the strategy, there are facts about this specific dialogue that would mitigate my criticisms of it. This did not take place in a worship service or any regular corporate gathering of the church. The church building was the venue, but this was a ticketed event, and it was clear enough (or should have been clear to sensible listeners) that what was being said by the Imam was not sanctioned by James White or the church leaders. The participants were not seeking spiritual partnership or even agreement, but understanding of one another's beliefs. The purpose of the meeting was educational, not ecumenical. Participants gave multiple disclaimers trying to make all of those things clear. The fact that it still wasn't clear to some well-meaning listeners is one of the key reasons I'm not in favor of these exercises. On the other hand, Mr. Howse and his little group of critics have (it seems to me) tried their best to eliminate any possible clarity about the purpose of the dialogues. From the start I have strongly suspected that this is not an honest effort on their part; hence my censures. Second John is a warning against teachers who pretend to be Christian and corrupt sound doctrine by stealth. That is manifestly not what was happening here. Nor did this entail any kind of spiritual partnership or unequal yoke. Dr. Qadhi was not presented to the Christians in the audience as a suitable spiritual leader, which is what the warning in 2 John forbids. A note for the easily confused: having a public discussion between scholars of two different religions is not the same thing as being "bound together" or engaging in a "spiritual enterprise" together. Please stop confusing the improper abandonment of specific confessional beliefs (which is what is required in compromising ecumenical movements) and two believing people presenting their positions for purposes of clarification and understanding. Whether in a debate (where those differences will be argued and examined in depth) or dialogue (where the argumentation and examination is left to the hearers rather than the participants), the reality is that both sides are not seeking a "middle road" or some kind of a compromise. Both believe their faith to be true, and the difference between the debate and the dialogue is the locus of where the argument will take place, nothing more. This is NOT the same thing as liberals getting together and throwing away their confessions and starting from scratch, looking for some kind of mash-up of their different religious traditions. Wouldn't you criticize anyone else who did what James White has done? Is Brannon correct in saying that your support for Dr. White is proof that there's a "Good Old Boy Club" that you are part of? James and I have not corresponded or conversed with one another about Brannon Howse or this current controversy. I think he left one or two comments in that massive FaceBook scrum under my original post, but they were not addressed to me, nor have I contacted him or sought his opinion on how to respond to Brannon Howse. No doubt James would have preferred for me to give my full approval to his dialogues with Qadhi. I've spoken as candidly as I can. The Tweet that posted on FaceBook back in mid-June still has an active thread with hundreds of comments and questions. You have simply ignored most of them. Why? I've been out of the office. I hope this clears up the most important issues people have raised. If not, those who are truly concerned about this can call me at Grace to You on or after today (Monday, 17 July 2017). The number at Grace to You is 661-295-5777. I'm back in the office now, and you can talk to me directly almost any day during normal business hours (9:00—4:00 Pacific time). I'm happy to answer people's questions and hear their concerns. I probably won't say any more publicly, because I think too much has been made of this whole issue already. But if any truly significant points are made or questions asked, I may add them to the questions I have answered here. You can check back next week for possible updates, but my hope is this is the last thing I'll need to say about the matter. "[Phil Johnson] never answered anything of relevance & definitely with no substance, only accusatory in nature." Thus a WorldView Weekend devotee dismisses the above answers. That comment was posted 28 August 2017 on Twitter, after a handful of fellow Howseites had batted the controversy around (also on Twitter) in 140-character sound bites for more than three months. This is clearly posturing, since Mr. Howse's home address is easily discoverable with a simple Google search, and the times and locations of all his conferences are announced weeks in advance. But Mr. Howse's chief sycophants cynically pretended that was a sincere apology and insisted I should welcome it as an overture of peace. 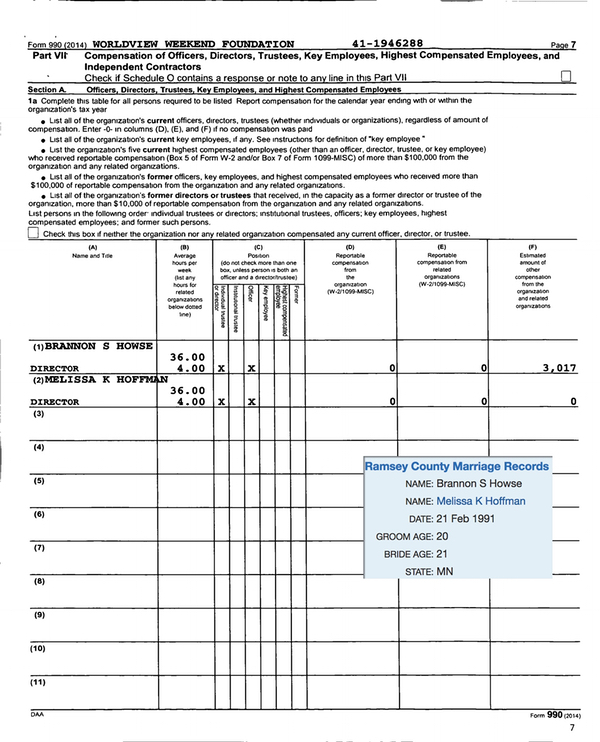 Howse himself is also the organization's "Executive Director." He has no meaningful accountability in that capacity; he is subject to no elder or pastor who has yet shown a willingness to own him as a member of the flock publicly (or even privately to those who have expressed concern); and he is committed to no discernible system of doctrine or hermeneutics. Given the fact that he frequently provokes overheated controversy by criticizing respectable Christian leaders, those are significant—even disqualifying—weaknesses. Several ardent followers of Worldview Weekend tried desperately to defend the lie that I had attacked the entire Howse family. They also mounted a failed attempt to keep the lid on the truth behind the misleading expression "our board." In the end, their argument boiled down to this: No one can furnish absolute proof that no real Board of Directors exists, and no one has questioned every church in the greater Memphis area to verify that none of them had Mr. Howse on their records. So as long as Mr. Howse keeps silence about his church affiliation, they reckoned questioning his accountability amounts to (in the words of their most tireless agitator) "slander, gossip & endangering lives." Neither reason nor common sense can penetrate such deliberate contumacy, and my concern is that those questioning the integrity of Mr. Howse's critics actually like the mud-slinging. So I'm done with the "debate." Regardless of the hysterical charge that I "never answered anything of relevance," I'm going to let the answers to the above questions, along with this footnote, stand as my final word on the matter—at least as far as the public controversy is concerned. For the record, I do regret having responded to these folks even after their giddiness and foolhardy obstinacy signaled that they had no intention of dealing with issues seriously (Proverbs 14:7; 18:2). For that, I beg everyone's forgiveness.